This post is a really helpful and eye-opening excerpt from #26: Triple Threat (now available on Kindle), which also covered anchoring, rock steps!, split weight and the French Open, but this section is important. Read on! Once the anchor is over [at the end of a WCS pattern], you have a choice: shake your partners' hand and say thank you and walk away, or, as will more often happen, you start the next pattern. Every pattern, and I do mean EVERY pattern in WCS starts on the "&" after the 6 or 8 of the last pattern. If it's an extended pattern, then it starts on the "&" that follow the last upbeat you finished anchoring on. Second, WCS requires that we travel in opposite directions. 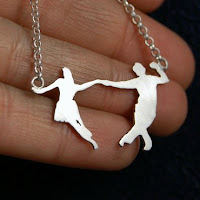 When you dance Foxtrot, both the man and the woman move in the same direction when you start dancing. That's how it is with most partner dances. Not so when it comes to WCS, Hustle, Shag, etc. But most of these dances have a built in "rubber band" action that occurs in the feet of their basics... rock steps, coaster steps, swivels, etc. But not WCS (another reason it's so hard.) The WCS basics don't have a rock step to help with the Rubber Band action. The only basic that does happens when the partners are, for the most part, moving in the same direction. No, WCS's Rubber Band, or "spring" action, all occurs in the center (aka, solar plexus, core, etc.) And, quite frankly, it occurs rather quickly. The Rubber Band literally takes up the counts "& - a - 1" at the start of every WCS pattern... ONLY. It's over after the "1." In fact, your center should be springing back on the "1." The pattern is off and running after the "1." move towards each other at the start of a pattern. The Rubber Band is NOT a big movement. When you use your center, you can pack a punch. For years my husband Nick didn't use his center in daily activities. He's still getting there, but there is not a movement I make in life where I'm not using the power of my center. As such, I was able to tackle my considerably taller and broader husband and win every time. I'm not kidding. Maybe it's TMI, but I seriously won every wrestling match with that man until I stupidly told him that he was "cake" because he never used his center. Yeah. Now I never win a wrestling match. I wouldn't even call it much of a "match" anymore! Drat. I'll regret sharing my secret with him for the rest of my life. Anyhow, you get my point. If you have control of your center, which is the size of a golf-ball, you can be four feet tall and knock over a Marine during a dance (bring back memories, anyone?) As such, you really don't need to move your center very far to get the "Rubber Band" to spring you into a pattern. 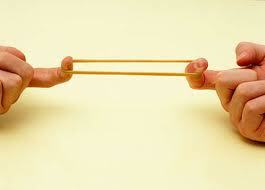 Now, that's not to say every single Rubber Band action will only move your center a half inch on every pattern. Depending on the song, on your partner, on your leverage, etc, it can vary from a 1/4 inch all the way up to 3 inches. That's seriously pushing it, though, I think- I've never had to move as much as 3 inches. Remember that it's hard to stay on time when moving that much in one beat alone. As a demonstration, I've put together this video for you of "& - a - 1" Rubber Band actions from 20 years of US Open winning routines. It's nothing short of groundbreaking. Start by watching the man's center actions, especially at the start of each pattern. If you want to watch all of these routines in their entirety, the DVD and VHS versions are still available for ordering online. It's called the 20th Anniversary Time Capsule. (They have since released a new compilation of the last 10 years, where you can see all of the technique and swing disappear as you watch - it's quite an informative DVD). Of course, I recommend you go to your club first- they might have it. And by all means! Try and watch all the tapes in their entirety too. I have to say... some of these competitions were FIERCE. Nothing was an easy win. All of the routines are worth watching. If you can watch 'em all... do it. Check with your local club. Throw a video party in your living room and gather your dance friends or club members and watch and learn together. For the rest of the note, you can purchase the full collection of Weekly Notes here. And don't forget to get things first by joining my email list!